Being a senior doesn’t mean you have to feel like a senior. As our bodies age, our sleep pattern also changes. Most folk after 60 struggle with sleep – from tossing and turning to waking up with stiff joints, neck and back pain. While many sleep just a few hours, those few hours of rest need to be quality uninterrupted sleep! Though many seniors are still active and in shape, some are not. Regardless of the physical activity the human body needs to recuperate and it does so best at night while you rest. 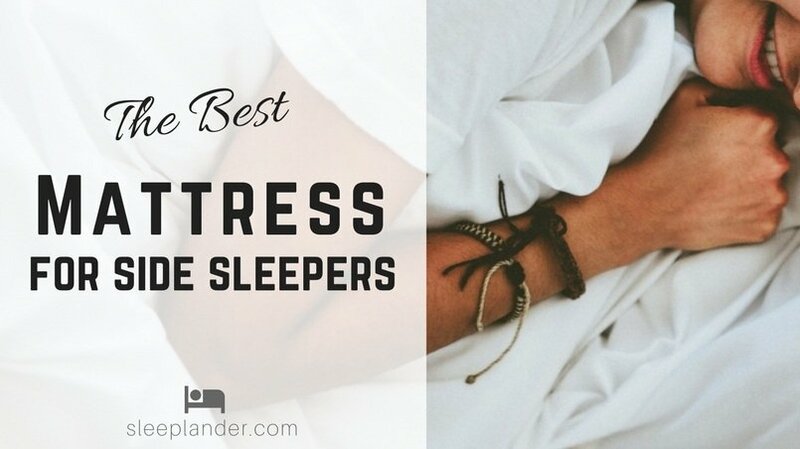 The following reviews document some of best mattresses for senior citizens that are comfortable, supportive and pressure relieving. Why You’ll Love It: The Leesa memory foam mattress sleeps cooler than most all-foam mattresses and is great if you need more mid-back support. If you’re on a budget, the Leesa bed has a solid offering at a very reasonable price point that will impress even the most savvy price conscious buyer. The Leesa mattress sounds so comfortable made with a 10″ stacked layering of foam and puffy quilted top cover. Its ideal because it has a cooling effect against night-sweating, which is pretty common and natural with seniors or elderly. This is because 2″ of the 10″ mattress is a special cooling foam layer and a 2″ memory foam layer. The last 6″ is solid foam base, no other metal or coils or strange shaped objects that will come close to the weight of your body´s weight. The combination of your body being cooled towards the surface of the bed, and being hugged from the memory foam, makes for a well-rested senior. It sits well on top of almost all types foundations too. No matter how you set your base up you will feel as if the mattress is firm and stable, and when you lay down you will feel how it comforts your every move and weight. It can be placed on solid or slatted bed bases and/or on a box spring as well with a base. The choice is yours! It’s medium comfort level provides the right balance between support and pressure-relieving comfort. The comfort layers of LSA200 polyfoam and memory foam alleviate pressure points and give sleepers less sinkage. Corporate social responsibility is high on the agenda from this little locally ran business in Virginia where they donate a free bed for every 10 sold, which is generous in today´s world. The free trial on this mattress is 100 nights, with a full refund, except for residents of Hawaii and Alaska; they charge a $100.00 fee for returns. Although they offer a 100-night trial, they recommend a minimum of 30 days so that your body can adjust to your new mattress. If you’re interested in giving a memory foam mattress a go, this is an affordable choice, great those for elderly folks that suffer from back pain plus it sleeps cooler than most all-foam mattresses. Why You’ll Love It: The Loom & Leaf mattress has multiple firming options, exceptional motion isolation to minimize disturbance. It’s conforming and pressure relieving and comes with free delivery and set up and old mattress removal! The 12″ Loom & Leaf ultra luxury memory foam mattress by Saatva was designed through research with the spine in mind, a mattress that is ideal for seniors with back pain offering excellent lumbar support. This mattress is the closest you’ll get to a Tempur-Pedic® orthopedic mattress but without the high price tag. The scientific energy put into the layering is clever. The Certi-PUR certified memory foam used is 5 lbs. that distributes weight very well, so well that it includes all seven strange positions that people sleep or lie in. By now you are imaging what position you sleep in and saying is it because the memory foam is 5lbs that it supports all positions. Well, there is also a cooling gel foam layer in the comfort system under the nicely quilted cover that targets the spinal area, supported with the memory foam that molds to every move you make. Under this layer is a very thick piece of foam that is breathable, providing airflow throughout your mattress. The L& L mattress provides so much cushioning with every wiggle that it relieves join aches and pains naturally. The company offers two firmness options. “Relaxed Firm” which is medium-firm and best suited for people with multiple sleeping positions. “Firm” zone for people who know they need a firmer mattress or are stomach and back sleepers. Importantly their cotton and foam materials are eco-friendly making it safe from gases that could be inhaled while sleeping. Flame resistant or flame-retardant material, as mentioned above, means safety, when buying a mattress, luckily the organic cotton cover is made with “thistle” and is a natural flame retardant. Bed bugs or mites are also common in mattresses, especially organic ones, so these are treated with a Guardian Protectant that hinders bugs and mites that can build up from body fluids. In 2015 L&L changed processes so that they could help reduce the carbon output that usually remains in the manufacturing business as well as have since used solar power when available. A mattress that feels so good means you are getting the best overall REM (Rapid Eye Movement) sleep that’s quality, deep sleep moments in a sleep state. This is not be ignored as it accounts for about 25% of sleeping state. If that is improved or hindering more non-REM periods, especially seniors will benefit from this. They also offer a 120-day trial and a 15 year warranty. It does not come vacuum-packed and in a box unlike other memory foam mattresses, but the company will help set it up for your for free. If the L&L mattress sounds like a good fit for you, read what other buyers have to say. Why You’ll Love It: The copper infused Layla mattress has two firmness options built in, a soft side for folks looking for pressure points relief and a firm side for great lumbar support. We think the Layla bed is a great offering at a good price. Layla Sleep is a flippable 10″ memory foam bed, where one side is soft, the other firm. The insides have copper and thermogel, so they work together as heat resistors, overall excellent for seniors or aging bodies. There are four layers, starting with a 3″ copper infused memory foam, then a 2″ convoluted support foam (ridged for airflow), under that a 4.5″ base support foam, and finally a 1″ base of copper infused memory foam. Bedding manufacturers refer to something called “variable support”. This occurs whenever copper is infused into a mattress, body weight forces the copper cells to interact with the memory foam creating extra needed compression under shoulders, hips and head areas. Calling folks to come and take an afternoon nap while drawing the super healing power of ions released by copper. Copper was even found to be used in the Egyptian pyramids 4,500 years ago. The mattress can be ordered in 6 sizes (Full, Twin, Twin XL, Queen, King, CA King). The excellent thing is that it has copper, the second-best conductive metal to high heat! Having copper infusion on the top and bottom layer is a smart thing, as these offer anti-microbial protection form the body and base nearest to the floor; two vulnerable zones. It can also be set up with or without a box spring and on a slatted/non-slatted base or platform or on a bunkie bed, too many options right! Not that options are bad, the decisions are harder to get to, but knowing quality products exist is still positive, especially when shopping online. You can try out this mattress free for 120 days, you will receive a full (100%) refund and will not be charged any transportation or shipping costs, no matter what state you live in. After purchase you receive a Lifetime Warranty, that includes sagging or depression that exceeds 1” from the surface. Ideal bargain for quality. Why You’ll Love It: The Zenhaven natural latex mattress has a flippable design with two different firmness options. Great for back pain and joint aches, conforming closely for targeted pain and pressure relief plus reduced nighttime sleep disturbances. Zenhaven is a 10″ luxury latex mattress with a dual-sided design. You have been hearing the word, “Talalay”, in mattress shopping lately. Well, it’s a type of latex being used, like in this mattress. Elastic comes from latex (tree sap), and its use has been made popular from the Dunlop company in Germany. Now – “Talalay” latex is being made in America and it involves two extra processing steps which has better results, though costly. You may be asking yourself why would I need latex in my bed, well it’s for elastic layering and optimum great cushioning. The Zenhaven mattress has been cleverly designed not least because of it’s main composition material– 100% Pure Talalay Latex! On one side the mattress has a Medium-Soft firmness rating, while the other has Firm feel. This all-natural, hypoallergenic mattress, is free of bacteria, mites, dust, mildew, etc. because of the Talalay latex material used. It’s natural cell structure is referred as open, meaning breathable, therefore allows air circulating in between, greatly cooling body heat and reducing human sweat. The Zenhaven mattress doesn’t trap heat like most memory foam mattresses, due to the breathable open cell structure of latex making it suitable for menopause and other folk who sleep hot at night. The dense Talalay latex keeps your spine aligned so you won’t wake up with your lower back hurting on this bed. Zenhaven uses natural organic Joma wool from New Zealand which acts a flame retardant because they retain moisture in their fibers. The mattress doesn´t contain old -fashioned bed springs made with a variety of metal, it´s basically all organic latex layering and organic cottons and fibers. Too simple to believe and is said to be very good for back pains and arthritis, which many seniors suffer from. This US-made 100% hand-crafted 2-in-1 flippable bed comes with a 120 a-day free trial and a 20- year warranty. Why You’ll Love It: Any sleeper can benefit from the Nectar Adjustable Bed. Particularly great for heavy snorers, scoliosis sufferers and folks with acid reflux. 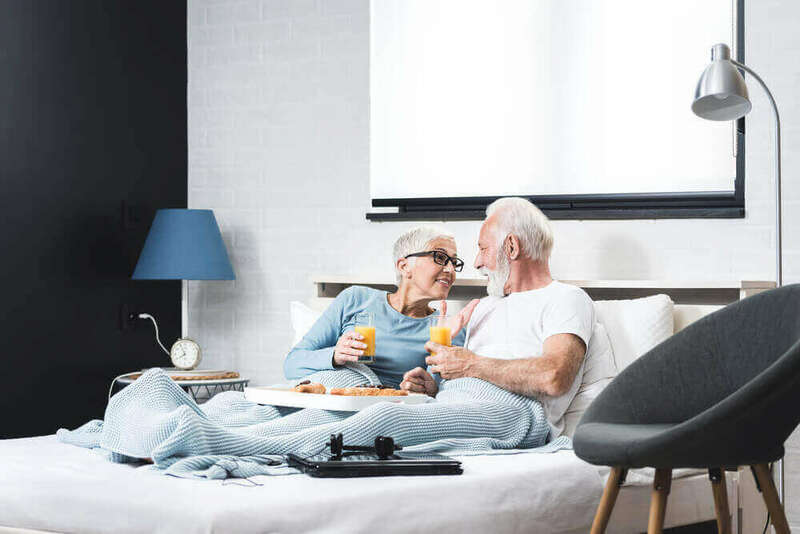 Since adjustable beds offer dual customization, couples with differing preferences can feel equally comfortable and supported. This adjustable bed frame has some incredible functions and is trendy with its built-in USB cable charger ports. The Nectar adjustable frame does not include the mattress, but you can certainly buy one that fits the same frame size. Get ready to be amazed. This bed has 2 separate cushioned bases attached to one frame. Each side of the base can be moved separately when you place 2 separate mattresses on it. So, one person can lay flat and sleep while the other has their head or feet or both raised up while reading or watching TV. The remote control is wireless and programmable and also controls a built-in, three zone massager, amazed right! The bed frame was designed after NASA´s scientific research when they created the best comfort possible for astronauts who had gone to live in space. That meant they designed for “Zero Gravity” conditions with body position and comfort in mind. And exactly that is what this bed frame also offers. It’s sounds unbelievable but yet the overall design, comforts the following health issues: sleep apnea, neck and back pain, scoliosis and acid reflux. The bed frame can hold a variety of mattress sizes such as Twin, Twin XL, Queen, King, and Split King (for separate mattress positions). You don´t have to be a senior to buy this bed frame because it appeals to people of all ages, but probably more so for seniors. The fact that it can put you in the upright or sitting position is a plus, and a big help for a spouse, family member or care-giver who normally has to use their own body strength to get someone in bed up. Its like bringing the hospital bed frame to the comfort of your home. The wireless control is also ideal as you can stick in your covers somewhere or on the night stand if you need it in the middle of the night. If you order this product you will receive “white glove” service, meaning they will pick up and remove your old bed frame and set up your new one for no extra cost. 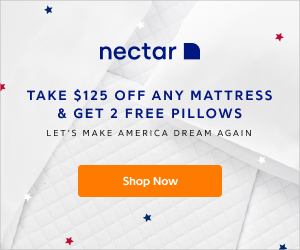 You can try the Nectar bed frame for 365 days, free, absolutely no charge if you return it and has a “Forever warranty” meaning lifetime, that´s right!